Considering the bandwidth, internet connections can be divided into two main categories. One is the so called “unlimited” connections (where the bandwidth is unlimited) and the second type called the “limited” connections, and they are based on a term called “FUP” (fair usage policy). “FUP” means that, your Internet connection will have a bandwidth limit and when you reach this limit, then you have to pay additional fees or the ISP will slowdown the speed. So if you have a FUP based connection (3G, WiMax, ADSL etc) then it’s essential to monitor the network and its monthly bandwidth if you want to avoid those slowdowns. 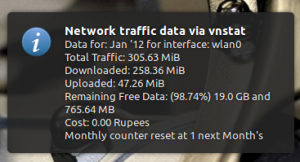 Now in Ubuntu Linux you can do this by installing a network bandwidth monitor such as NTM. Or if you’re looking for something that’s based on the command-line (still as good as NTM if not better) then I highly recommend vnstat, because it’s awesome! 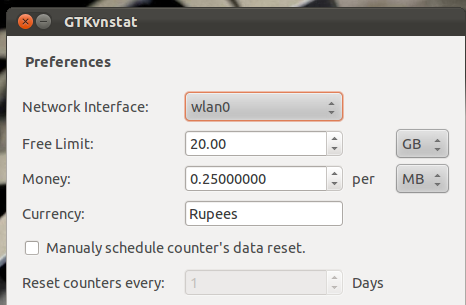 :D.
But there’s a GUI front-end written for the “vnstat” called “GTKvnstat” that lets you monitor the bandwidth and calculate the additional cost after you’ve reached the FUP. *. It has a simple interface that lets you enter the preferred network interface, input the monthly usage limit (either in MB or GB), enter cost per MB/KB, currency & change the automatic data reset date. 2. Downloaded or Uploaded traffic. 3. Remaining traffic (both in MB/GB and percentages). 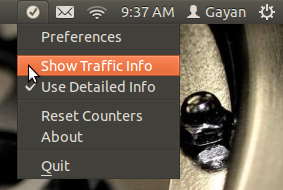 You manually Reset the statics and includes a much simpler traffic detail notifier as well. You can install GTKvnstat in Ubuntu 12.04 Precise Pangolin, 11.10 Oneiric Ocelot, 11.04 Natty Narwhal, 10.10 and 10.04 by first downloading the “.deb” file from this gtkvnstat home page. Then once the download is complete, simply double click on the file. Now since this is based on “vnstat”, it should install it automatically for you. But for some reason it doesn’t, then you can do it manually in Ubuntu by typing the below command in your Terminal window. But please remember that, GTKvnstat is primarily a network bandwidth cost calculator, rather than being a regular usage monitor such as “vnstat”. Good luck. Qt Based (Free) Open Source Art & Office Productivity Suite – Calligra! Hmm, that is strange. If you have just installed Ubuntu, then try the below command first. And then try installing ‘vnstat’. Can GTKvnstat display “3g Dongle” usage also? P.S: Sorry about the late response ‘pranay’ 🙂 , have been a bit busy lately.